According to Sealy the Embody Latex Mattress feels very similar to an innerspring mattress and gives the impression that you are sleeping “ON the mattress”. The Embody Memory Foam Mattress feels very different from an innerspring, and it gives the impression that you are sleeping “IN the mattress” (likely because memory foam lets you sink into the mattress and it conforms to the body). 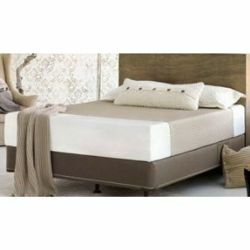 With both the Embody Latex and Embody Memory Foam mattresses Sealy highlights their ability to “breath” indicating that both the design and fabrics help to move air in and out of the mattress thereby effectively regulating temperature. The fabric used in the Embody line is called Body Climate. It is a special fabric made by Polartec that features air channels and also helps remove moisture. The mattress designs (often described as contemporary and sophisticated) are the result of a partnering between Sealy and the design consultancy IDEO. The foams used in the all of the Embody mattresses have no formaldehyde or other ozone depleting chemicals and are also anti-microbial (resistant to dust mites and microbes). The Embody Memory Foam mattresses are no-flip, use FlameGuard rayon fiber, and are made in the USA. They also come in 4 different styles – Level 1 through Level 4. The Embody Latex mattresses are no-flip, use FlameGuard rayon fiber, and are made in the USA. They also come in 4 different styles – Level 1 through Level 4. According to Sealy the Embody line of mattresses come with a full 20 year warranty. However some retail sites list the warranty as 10 years. Before making a purchase we would suggest asking the retailer for the warranty provided with the mattress (and you may wish to point them to the warranty information on the Sealy website).